War has always sought to use the most advanced and sophisticated tools to advance its cause. From the hot-air balloon to the atomic bomb, wars have been responsible for many inventions in the history of mankind. While the Internet itself can largely be accredited to the US military, it seems that the current Israeli/Hamas war in Gaza is the coming of age (and conscription) of social media technologies. 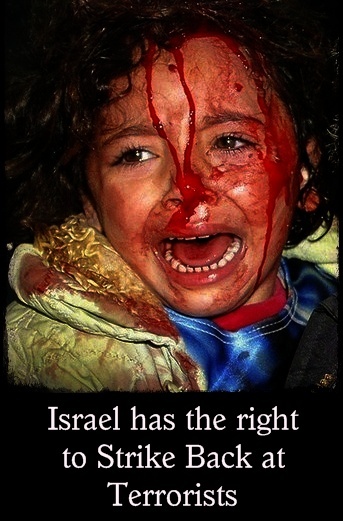 This provocative and ironic image called "Child of Gaza" on Flickr from Smallislander (cc) is accompanied by comments from both sides. With the Israeli authorities, in spite of an Israeli Supreme Court ruling, preventing foreign journalists from entering Gaza the shortage of information coming from within the war-zone is apparent. Broadcast media are turning to locals who are creating home-made videos and uploading them onto the Internet. Blogs, photo and video diaries from local journalists and individuals are the only regular sources of information from within Gaza. Palestinian ex-pats are sharing news from family and friends who still live in Gaza. Israeli individuals are also blogging about their experiences and their views on what is happening. There are clearly stories to be told on both sides. Perhaps the most fascinating piece in all of this is the State of Israel’s approach to media. Preventing foreign journalists from reporting from within Gaza has effectively bypassed the perceived bias of the foreign media. Control of information in a time of war has always been critical. The Israeli war-machine has mastered the control of information, making the best use of the new technologies that are available to it. There are a number of official Israeli blogs. On one official blog today you will find a post about how “family pets are suffering from Hamas’s rocket fire.” Israel has an official Twitter channel, a YouTube channel, a Facebook profile and a MySpace profile. Print and broadcast media has always positioned itself up as the independent verifiers of facts in wartime situations. By and large it is hard to concur that all media reporting of recent wars has been truly independent. Israel it seems would agree and is not just ignoring traditional media, but is creating its own content and information and disseminating it in spite of traditional media. And they are distributing their message worldwide, instantly and continuously. Furthermore, they are conversing with audiences, answering their questions and getting their own point across without any editorial reviews. Truth is often said to be the first victim of war. Truth is surely getting harder to discern in a world where the “traditional” sources of truth are left speechless. Finding truth is perhaps more difficult to find today but then truth was never meant to be easy. Leaving opinion aside is difficult but not impossible. This study of Associated Press’ coverage shows clearly the distortion in mainstream reporting of the conflict. “We recognize that reporting on Israel/Palestine is a controversial topic. Therefore, while there are many possible ways to measure accuracy, we chose criteria that are relevant, conducive to statistical analysis, and immune to subjective interpretation. “…our findings suggest a pattern of distortion in AP coverage of the Israeli-Palestinian conflict inconsistent with normal journalistic standards. Such a pattern of distortion, in which readers were given the impression that the Israeli death rate was greater than it was, and that the Palestinian death rate was considerably smaller than its reality, may serve to misinform readers rather than inform them. Gaza at the Expense of Darfur? I wonder where all of the Muslims were when the conflict in Darfur was raging, for example, (and it still is going on). And of course, the majority of the reaction to that is something along the lines of “yeah but if you support Darfur you have to inprinciple support the Palestinians” or you’ll hear “oh what is going on in Darfur is being made up or blown out of proportion by the evil Western Zionist media”, or if you bring up the fact that many Muslims get involved/upset, etc., about Palestine, yet ignore other conflicts involving Muslims, you’ll ve told how Palestine is so much more important, than those other places, or you’ll be told that if you bring up other conflicts then that must necessarily mean that you don’t care or care less about the Palestinians. And frankly, this kind of sentiment makes me angry! Because if the government of Sudan was Christian or Jewish, you can bet that a good many Muslims would be all over the Darfur conflict, and conversely, if the Israel/Palestinian conflict was between Muslims, there’d be nary a peep out of the community, save for a few “yeah what is going on in Darfur is bad but …”. And it’s the, what I call, the “yeah but” comments I’m hearing that is so aggravating to me! I mean, what’s wrong is wrong, if people are being raped, murdered, driven from their homes, bombed, starved, etc., then it’s wrong, it should be condemned, whether or not it’s the “evil Zionists” or our fellow co-religionists doing these awful things! And why is it so hard for Muslims to grasp this? Why are we so ready to speak out against Israel, yet make justifications for the Sudanese government, or Saddam Hussein (back when he was gassing his own people), or even Bin Laden? And we wonder why we’re in the state that we are in as an Ummah? If we can’t even speak the truth, even if it’s against our own selves, then how can we expect Allah to improve our condition? If we jump up and down, scream, cry, holler, when it’s non-Muslims killing us, yet try to justify when our own fellow brothers and sisters are killing us! And we expect “victory from the kuffar”? When we speak outagsint one wrong or inusitce at the expense of another equally wrong or inustice? Dean, and this is why more people will look elsewhere for reliable information. Hamed, thank you for leaving a comment and while I respect your views I wonder if what you have written here is your’s or someone else’s.